Medieval homes from three archaeological layers covering the period from the middle of the 9th century AD until the second half of the 11th century AD have been unearthed during the 2015 summer excavations in Pliska, the capital of the First Bulgarian Empire (632/680-1018 AD) between 680 and 893 AD. In addition, the archaeologists have excavated a small wooden rampart in Pliska discovering over 200 different artifacts. As an archaeological site Pliska is especially interesting as an archaeological site for a number of reasons, including its huge area, and its planning according to the tradition of the Ancient Bulgars after they settled south of the Danube, in today’s Northern Bulgaria, in the second half of the 7th century AD. According to some experts, Pliska may have been the largest city by territory in medieval Europe when its Outer City is taken into account. The artifacts discovered over the 2015 summer digs at Pliska have to do with the everyday life of the people in the First Bulgarian Empire in the 9th-11th century AD, lead archaeologist Assoc. Prof. Pavel Georgiev has told Radio Focus Shumen. They include coins, household items, tools, belt buckles, vessels and decorations; they are made primarily of copper, bronze, and ceramics. One of the very interesting finds is a set of six intact household vessels discovered inside a stove in one of the medieval Bulgarian homes. 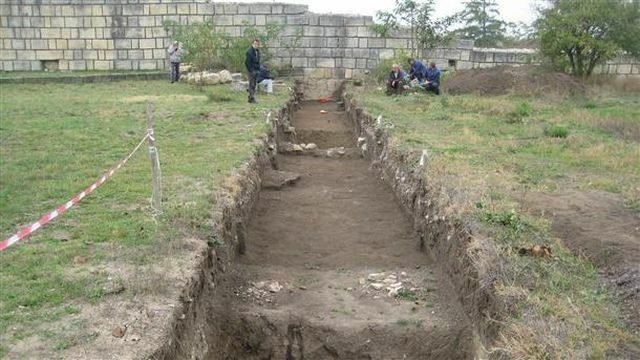 The total area in the Ancient Bulgar city of Pliska excavated by the archaeologists during the 2015 summer digs is 300 square meters; it is located in the northwestern section of the Inner City of Pliska. The uppermost archaeological layer found on that territory features stone buildings from the 11th century; that is, after the First Bulgarian Empire was conquered by Byzantium in 1018 AD. “[These stone buildings] are almost destroyed, they are sometimes hard to discern. They are typical about the last of phase of the life of Pliska, ca. 1060s-1070s AD," explains Georgiev. As part of the earlier layer dating back to the first half of the 11th century, the archaeologists have excavated about 20 semi-pit-houses (the so called sunken featured buildings). Four of these pit-houses have been found to have been destroyed simultaneously in a major fire. Other revealed structures from this time period include stoves and kilns for baking bread and a flour-milling facility which provide additional information for the everyday life of the population of Pliska at the time. The earliest layer excavated by Georgiev’s team dates back to the second half of the 9th century and the beginning of the 10th century. “These are wooden structures with well established foundations whose planning we are yet to explore. I hope we will be able to achieve this during the next archaeological season," the lead archaeologist is quoted as saying. In addition to the said archaeological layers, the archaeologists have explored a rectangular medieval well; they have descended to a depth of 11 meters. According to Georgiev, the well in question was for common use, and was in operation in the first half of the 11th century. The archaeologist says the results from the 2015 summer excavations in Pliska are impressive since the discoveries provide new information not just about the urban area of the earliest Bulgarian capital south of the Danube but also about the life and culture of medieval Bulgaria as a whole.